The Nobel Memorial Prize in Economic Sciences, officially known as The Sveriges Riksbank Prize in Economic Sciences in Memory of Alfred Nobel (Swedish: Sveriges riksbanks pris i ekonomisk vetenskap till Alfred Nobels minne), is awarded annually by the Royal Swedish Academy of Sciences to researchers in the field of economic sciences. The first prize was awarded in 1969 to Ragnar Frisch and Jan Tinbergen. Each recipient receives a medal, a diploma and a monetary award that has varied throughout the years. In 1969, Frisch and Tinbergen were given a combined 375,000 SEK, which is equivalent to 2,871,041 SEK in December 2007. The award is presented in Stockholm at an annual ceremony on December 10, the anniversary of Nobel's death. As of the awarding of the 2018 prize, 50 Nobel Memorial Prizes in Economic Sciences have been given to 81 individuals. Up to 2007, nine awards had been given for contributions to the field of macroeconomics, more than any other category. The institution with the most affiliated laureates in economic sciences is the University of Chicago, which has 30 affiliated laureates. ^ "Nomination and Selection of the Laureates in Economics". Nobel Foundation. Archived from the original on 2008-07-15. Retrieved 2008-10-15. ^ a b "The Sveriges Riksbank Prize in Economic Sciences in Memory of Alfred Nobel 1969". Nobel Foundation. Retrieved 2008-10-14. ^ "The Nobel Prize". Nobel Foundation. Retrieved 2008-10-15. ^ "The Nobel Prize Award Ceremonies". Nobel Foundation. Archived from the original on 2008-08-22. Retrieved 2008-10-07. ^ "All Laureates in Economics". Nobel Foundation. Retrieved 2014-10-17. ^ "Economics Table". Nobel Foundation. Retrieved 2008-10-15. ^ "Nobel Laureates of UChicago". The University of Chicago. Archived from the original on 2012-09-08. Retrieved 2018-10-10. ^ "The Sveriges Riksbank Prize in Economic Sciences in Memory of Alfred Nobel 1970". Nobel Foundation. Retrieved 2008-10-14. ^ "The Sveriges Riksbank Prize in Economic Sciences in Memory of Alfred Nobel 1971". Nobel Foundation. Retrieved 2008-10-14. ^ "The Sveriges Riksbank Prize in Economic Sciences in Memory of Alfred Nobel 1972". Nobel Foundation. Retrieved 2008-10-14. ^ "The Sveriges Riksbank Prize in Economic Sciences in Memory of Alfred Nobel 1973". Nobel Foundation. Retrieved 2008-10-14. ^ "The Sveriges Riksbank Prize in Economic Sciences in Memory of Alfred Nobel 1974". Nobel Foundation. Retrieved 2008-10-14. ^ "The Sveriges Riksbank Prize in Economic Sciences in Memory of Alfred Nobel 1975". Nobel Foundation. Retrieved 2008-10-14. ^ "The Sveriges Riksbank Prize in Economic Sciences in Memory of Alfred Nobel 1976". Nobel Foundation. Retrieved 2008-10-14. ^ "The Sveriges Riksbank Prize in Economic Sciences in Memory of Alfred Nobel 1977". Nobel Foundation. Retrieved 2008-10-14. ^ "The Sveriges Riksbank Prize in Economic Sciences in Memory of Alfred Nobel 1978". Nobel Foundation. Retrieved 2008-10-14. ^ "The Sveriges Riksbank Prize in Economic Sciences in Memory of Alfred Nobel 1979". Nobel Foundation. Retrieved 2008-10-14. ^ "The Sveriges Riksbank Prize in Economic Sciences in Memory of Alfred Nobel 1980". Nobel Foundation. Retrieved 2008-10-14. ^ "The Sveriges Riksbank Prize in Economic Sciences in Memory of Alfred Nobel 1981". Nobel Foundation. Retrieved 2008-10-14. ^ "The Sveriges Riksbank Prize in Economic Sciences in Memory of Alfred Nobel 1982". Nobel Foundation. Retrieved 2008-10-14. ^ "The Sveriges Riksbank Prize in Economic Sciences in Memory of Alfred Nobel 1983". Nobel Foundation. Retrieved 2008-10-14. ^ "The Sveriges Riksbank Prize in Economic Sciences in Memory of Alfred Nobel 1984". Nobel Foundation. Retrieved 2008-10-14. ^ "The Sveriges Riksbank Prize in Economic Sciences in Memory of Alfred Nobel 1985". Nobel Foundation. Retrieved 2008-10-14. ^ "The Sveriges Riksbank Prize in Economic Sciences in Memory of Alfred Nobel 1986". Nobel Foundation. Retrieved 2008-10-14. ^ "The Sveriges Riksbank Prize in Economic Sciences in Memory of Alfred Nobel 1987". Nobel Foundation. Retrieved 2008-10-14. ^ "The Sveriges Riksbank Prize in Economic Sciences in Memory of Alfred Nobel 1988". Nobel Foundation. Retrieved 2008-10-14. ^ "The Sveriges Riksbank Prize in Economic Sciences in Memory of Alfred Nobel 1989". Nobel Foundation. Retrieved 2008-10-14. ^ "The Sveriges Riksbank Prize in Economic Sciences in Memory of Alfred Nobel 1990". Nobel Foundation. Retrieved 2008-10-14. ^ "The Sveriges Riksbank Prize in Economic Sciences in Memory of Alfred Nobel 1991". Nobel Foundation. Retrieved 2008-10-14. ^ "The Sveriges Riksbank Prize in Economic Sciences in Memory of Alfred Nobel 1992". Nobel Foundation. Retrieved 2008-10-14. ^ "The Sveriges Riksbank Prize in Economic Sciences in Memory of Alfred Nobel 1993". Nobel Foundation. Retrieved 2008-10-14. ^ "The Sveriges Riksbank Prize in Economic Sciences in Memory of Alfred Nobel 1994". Nobel Foundation. Retrieved 2008-10-14. ^ "The Sveriges Riksbank Prize in Economic Sciences in Memory of Alfred Nobel 1996". Nobel Foundation. Retrieved 2008-10-14. ^ "The Sveriges Riksbank Prize in Economic Sciences in Memory of Alfred Nobel 1997". Nobel Foundation. Retrieved 2008-10-14. ^ "The Sveriges Riksbank Prize in Economic Sciences in Memory of Alfred Nobel 1998". Nobel Foundation. Retrieved 2008-10-14. ^ "The Sveriges Riksbank Prize in Economic Sciences in Memory of Alfred Nobel 1999". Nobel Foundation. Retrieved 2008-10-14. ^ a b "The Sveriges Riksbank Prize in Economic Sciences in Memory of Alfred Nobel 2000". Nobel Foundation. Retrieved 2008-10-14. ^ "The Sveriges Riksbank Prize in Economic Sciences in Memory of Alfred Nobel 2001". Nobel Foundation. Retrieved 2008-10-14. ^ a b "The Sveriges Riksbank Prize in Economic Sciences in Memory of Alfred Nobel 2002". Nobel Foundation. Retrieved 2008-10-14. ^ a b "The Sveriges Riksbank Prize in Economic Sciences in Memory of Alfred Nobel 2003". Nobel Foundation. Retrieved 2008-10-14. ^ "The Sveriges Riksbank Prize in Economic Sciences in Memory of Alfred Nobel 2004". Nobel Foundation. Retrieved 2008-10-14. ^ "The Sveriges Riksbank Prize in Economic Sciences in Memory of Alfred Nobel 2005". Nobel Foundation. Retrieved 2008-10-14. ^ "The Sveriges Riksbank Prize in Economic Sciences in Memory of Alfred Nobel 2006". Nobel Foundation. Retrieved 2008-10-14. ^ "The Sveriges Riksbank Prize in Economic Sciences in Memory of Alfred Nobel 2007". Nobel Foundation. Retrieved 2008-10-14. ^ "The Sveriges Riksbank Prize in Economic Sciences in Memory of Alfred Nobel 2008". Nobel Foundation. Retrieved 2008-10-14. ^ a b "The Sveriges Riksbank Prize in Economic Sciences in Memory of Alfred Nobel 2009". Nobel Foundation. Retrieved 2009-10-12. ^ "The Prize in Economic Sciences 2010". Nobel Foundation. Retrieved 2010-10-11. ^ "The Prize in Economic Sciences 2011". Nobel Foundation. Retrieved 2011-10-10. 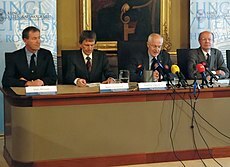 ^ "The Sveriges Riksbank Prize in Economic Sciences in Memory of Alfred Nobel 2012". Nobel Foundation. Retrieved 2016-07-01. ^ "The Sveriges Riksbank Prize in Economic Sciences in Memory of Alfred Nobel 2013". Nobel Foundation. Archived from the original on 2017-06-02. Retrieved 2016-07-01. ^ "The Sveriges Riksbank Prize in Economic Sciences in Memory of Alfred Nobel 2014". Nobel Foundation. Retrieved 2014-10-13. ^ "The Sveriges Riksbank Prize in Economic Sciences in Memory of Alfred Nobel 2015". Nobel Foundation. Retrieved 2015-10-12. ^ "The Sveriges Riksbank Prize in Economic Sciences in Memory of Alfred Nobel 2016". Nobel Foundation. Archived from the original on 2016-10-10. Retrieved 2016-10-10. ^ "The Sveriges Riksbank Prize in Economic Sciences in Memory of Alfred Nobel 2017". Nobel Foundation. Archived from the original on 2017-10-02. Retrieved 2015-10-09. ^ "The Sveriges Riksbank Prize in Economic Sciences in Memory of Alfred Nobel 2018". Nobel Foundation. Retrieved 2018-10-08.